Can your glass make your beer taste better? 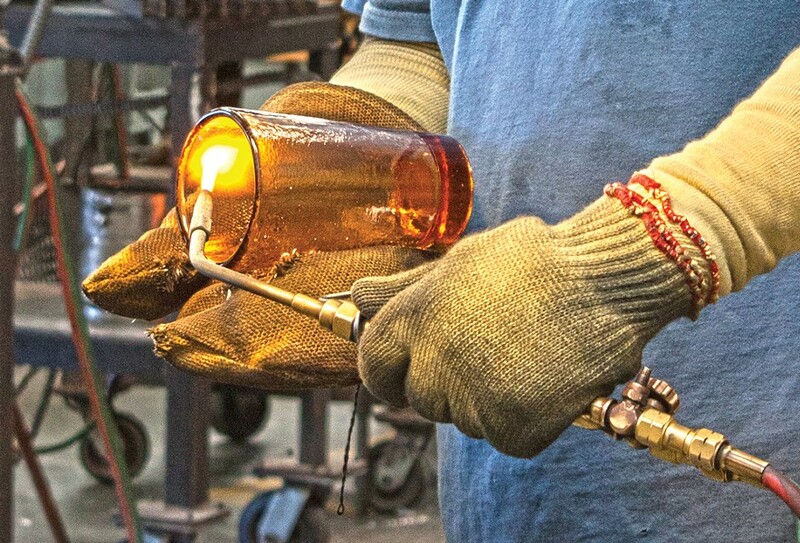 Photo by Carrie Peyton Dahlberg A glass casting expert smoothes the finish on a Fire & Light pint glass in Arcata. This is a story about marketing, glassware and how your brain loves you and wants you to be happy. Let's start in 2001, when a French study used food coloring to dye white wine red. People who should know a little something about wine (in this case, enology undergrads in France) described its flavor notes with terms commonly used to describe reds. Interestingly, many of them described the exact same wine quite differently when it wasn't dyed. Appearance overrode taste and smell. Next, on to 2008, when CalTech and Stanford researchers teamed up to give tastes of wine to people in MRI machines that measure brain activity. When people were told — falsely — that they were getting more expensive wines, areas of the brain thought to be associated with pleasant experiences became more active. People also said those wines tasted better. I love that study. I love it because it tells a more complicated story than one about poor rubes being tricked by marketing. We know our brains can sometimes heal us with a sugar pill (the well-documented placebo effect). It's a triumph for every optimist who's ever raised a glass that our brains can also help us have a good time when we're expecting one. Thank you, medial orbitofrontal cortex. These are wine studies but the parallels to beer are clear. Charlie Bamforth, distinguished professor of malting and brewing at the University of California, Davis, assures me that multiple studies verify the huge influence that appearance and expectations play in blind taste tests of beer. I phoned Bamforth hoping he could help me understand the science behind the latest generation of "craft beer" glasses that are etched inside to keep beer bubbles bubbling or shaped in ways their designers say enhance flavor and better focus aromas. We talked about the drinking traditions in Belgium and Germany, where taverns for decades have hauled out specially shaped glasses for different beer styles and brands. "You're going to be influenced by the entire drinking ritual," Bamforth says. "It's charming and it's lovely and I'm all for it. But whether there's a fundamental impact on the flavor other than psychological, I very much doubt." In scholarly studies, Bamforth and other researchers ask beer drinkers to rate beers in darkened rooms or while wearing dark glasses because the look of a beer is well known to crowd out other sensory information. To test a glass shape, he says, you'd have to somehow keep the drinker from seeing or holding the glass. That brings me to Mike and Meredith. When I started asking local brewers what they like to drink from, Six Rivers' Meredith Maier said I had to come by and try a stout glass she'd first seen demonstrated at a workshop in Portland. She poured Six Rivers' Macadamia Nut Porter into three different glasses and let the aroma do the talking. The beer in one glass tasted fuller, richer, just more itself — as if something had amplified it without changing a thing. I peered through the bottom to read the glassmaker's name: Spiegelau. "It's crazy how much the shape of the glass matters," Maier said. Then I talked to Mike Smith, head brewer at Eel River in Fortuna, who told me that when he's out barbecuing, he puts his IPA in a good, sturdy tumbler that stands up to backyard fun beside his 3-year-old. But when he really wants to focus on the beer, he'll get out Spiegelau's IPA glass. "The aroma presence is much more pronounced in that glass," Smith said. "When you get down to the bottom of the bell, even when there is hardly any left, you still get the full presence of the aroma. That's unique about that glass." "Now, some of that might be psychological," he said. Of course I ordered some Spiegelau IPA glasses. I really wanted my brain to make my favorite beer style taste even more amazing. They arrived right before this column was due. Maybe I haven't given them enough time or tried them with the right IPA, but so far ... meh. Sometimes the sugar pills don't work. Don't let me discourage you, though. You might have a more sensitive nose, or a more sophisticated palate, or a brain that loves you better. Have some fun creating your own, personal beer placebo. Are you a Humboldt-made devotee? 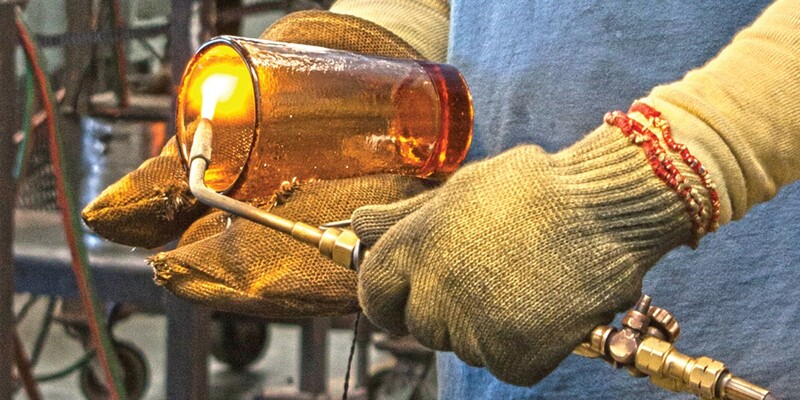 Pour your beer into one of Fire & Light's jewel-sparkling pint glasses, made in Arcata and featured with local brews at the Humboldt Bay Tourism Center in Eureka. On a budget? Fish out any big, brandy-snifter-shaped glass from your cupboard and try a beer from it. Traveling nearby-ish? Stop in at Sierra Nevada in Redding for an IPA glass or at Rogue in Newport, Oregon, for a stout glass. Teams from both breweries helped test different glass shapes for Spiegelau — probably not while blindfolded, although I haven't heard back from the glassmaker yet. Or heck, buy any beer glass at your favorite brewery and see if all the happy associations kick in when you next use it. For now, though, my favorite glass for drinking beer? A full one. Friday, July 1, Close out shark week with a shark beer cruise on The Madaket. Expect shark trivia, shark shwag and Lost Coast Brewery's sharkiest beers on either of two special cruises departing at 5:30 and 7 p.m. from C Street in Eureka. It's $10 for the boat ride that keeps you out of any shark-infested waters. Beer is extra. July on tap: Look for a couple of intriguing new beers this month. A mostly Humboldt sour gruit, made with local jasmine, sage and lavender (but no hops) arrives in early July at Humboldt Regeneration in McKinleyville. All month, Eel River Brewing in Fortuna can ease your Oysterfest withdrawal with its Kumamoto Stout, brewed with oysters, cocoa nibs and Mexican chocolate. Thursday, July 7: Learn how to brew your own or taste other people's homebrews at the monthly meeting of the Humboldt Homebrewers, 7-9 p.m. at Humboldt Beerworks in Eureka. Free to attend; $20 annually to join. Saturday, July 9: Try lagers, pilsners, fruit beers and IPAs from Humboldt and beyond at Barbecue and Brew from 5 p.m. to dusk at Garberville's rodeo grounds. Dinner, live music, beer tasting and a silent auction all benefit the Heart of the Redwoods Hospice. $30 includes dinner and beer or cider; $5 more for personalized tasting advice from the folks hoping to open Gyppo Ale Mill in Shelter Cove. Saturday, July 9: Raise a glass to help out the Humboldt Folklife Society at Mad River Brewing, which is donating $1 from every pint sold all day to benefit the Folklife Festival. Music starts at 6 p.m.
Wednesday, July 27: It's pirate night at the 7 p.m. Crabs' game in Arcata, so of course there will be Arrgh! pale ale from Lost Coast Brewery. $9 adults; $6 students and seniors for the game; beer is extra. Sunday, Aug. 7: It's National IPA Day. Lift a glass/mug/jug/bottle/can and check out IPA specials at a brewery near you. Do you have a glass you're sure makes the beer taste better? Email Carrie Peyton Dahlberg at beerstainednotebook@gmail.com.